Which returns us to the Sun. There is a very well-known, long-period, and still mysterious variability associated with the largest "hyperdimensional gate" in our own neighborhood -- our "local" star, the Sun. 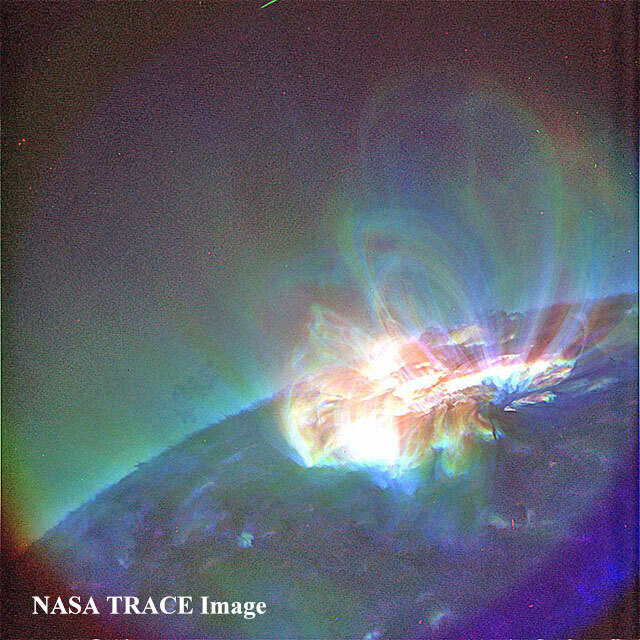 Its complex changes, which include a host of related surface phenomena -- solar flares, coronal disturbances, mass ejections, etc. -- is termed "the sunspot cycle" ... because the number of simultaneous "spots" (lower-temperature vortices appearing "dark" against the hotter solar surface, as this activity occurs -- left) waxes and wanes over about 11 years. In the 1940’s, the Radio Corporation of America (RCA) hired a young electrical engineer -- John Nelson -- in an effort to improve the reliability of HF ("short-wave") radio communications around Earth. 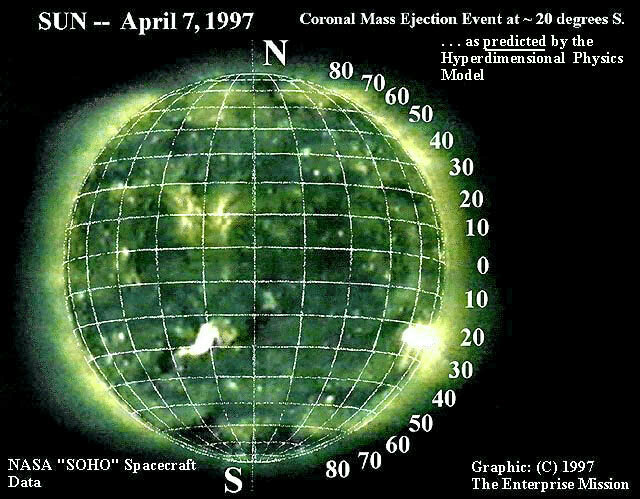 Such radio transmissions had been observed to be, for some reason, more reliable in the "lulls" in between, than during solar activity associated with "peak" sunspot years. 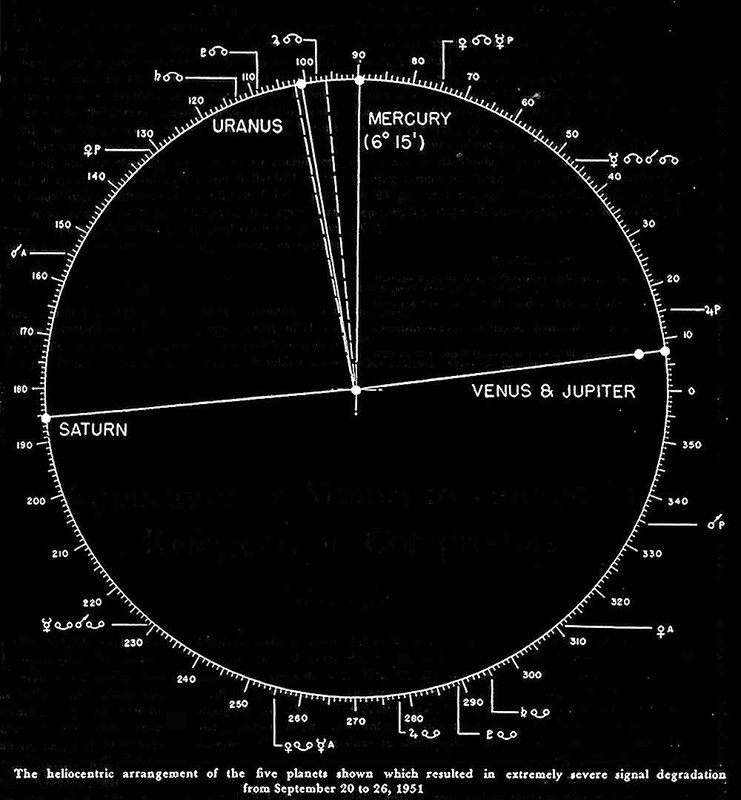 To his surprise, Nelson soon specifically correlated this rising and falling radio interference with not only sunspot cycle, but with the motions of the major planets of the solar system; he found, to his increasing astonishment, a very repeatable -- in essence, astrological correlation ... between the inexorable orbits of all the planets (but especially, Jupiter, Saturn, Uranus and Neptune -- which, remember, hold essentially all the solar’s system’s known angular momentum) ... and major radio-disturbing eruptions on the Sun! 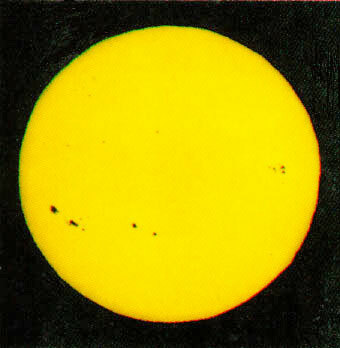 "It is worthy of note that in 1948 when Jupiter and Saturn were spaced by 120 degrees, and solar activity was at a maximum, radio signals averaged of far higher quality for the year than in 1951 with Jupiter and Saturn at 180 degrees and a considerable decline in solar activity. In other words, the average quality curve of radio signals followed the cycle curve between Jupiter and Saturn rather than the sunspot curve ... [emphasis added]." 1) Points to the (literally!) deepest implications of the simple astronomical fact that the "tail wags the dog"-- that the planets in this physics are fully capable of exerting a determinant influence on the Sun -- and each other -- through their disproportionate ratio of total solar system angular momentum ... over 100 to 1, in the [known!] planets’ favor. 2) Only the Hyperdimensional Model, possesses the precise physical mechanism -- via Maxwell’s "changing quaternion scalar potentials" -- accounting for this "anomalous" planetary angular momentum influence. Furthermore, recent discoveries via the indirect technique of "helioseismology" (optical monitoring of sound waves vibrating back and forth within the Sun), have revealed another clear solar "hyper-dimensional signature at play; a curious "jet," flowing around the north pole several thousand miles below the visible solar surface; the remarkable similarity to an equivalent phenomenon discovered by Voyager flowing around the north pole of Saturn -- a "polar hexagon" (click image right) in the clouds -- even to the latitude, seems just a bit "too coincidental." Described first by Kepler as his "Third Law," the farther out a planet orbits from its star the longer is its period of revolution. Since we’re talking about possible additional planets driving this entire Hyperdimensional Solar Process (see again angular momentum diagram, above) -- planets that must be hundreds of times farther from the Sun than Earth (Pluto is "only" 40 times its distance, and orbits in "only" about 250 years) -- the "years" of these extremely distant worlds could equal thousands if not tens of thousands of Earth’s year ... depending on their orbits. Because of these immense orbital periods, the cycles of solar energy production driven by their combined angular momentum will also be v-e-r-y long, indeed... perhaps as long as ~26,000 years ... (remember that number). Also remember that such distant planets -- even if not particularly massive -- will have a disproportionately large effect on the total solar HD energy generation, because of the enormous "leverage" in the angular momentum equation with increasing distance. Thus, these still undiscovered worlds must in fact account for most of the solar energy we see ... depending on the actual orbital periods; the repeated ultra-long-term phasing of their orbits -- creating equally long-term angular momentum resonances in the Sun -- must produce resulting long-term cyclic changes in the Sun’s total luminosity ... lasting literally thousands of years ... far longer than the short-term, historical "sunspot cycle" Nelson first linked directly to the known members of the solar system. There is already a well-known link, between the historical 11-year "sunspot cycle" -- increased solar flares, x-ray emission, frequency of "coronal mass ejections," etc. -- and a measurable (if inexplicable as yet) increase in total solar energy production. Misnamed "the solar constant" (click image left), this cyclic increase and decrease (according to satellite measurements) is curiously in phase with the current sunspot cycle ... averaging about 0.15%. 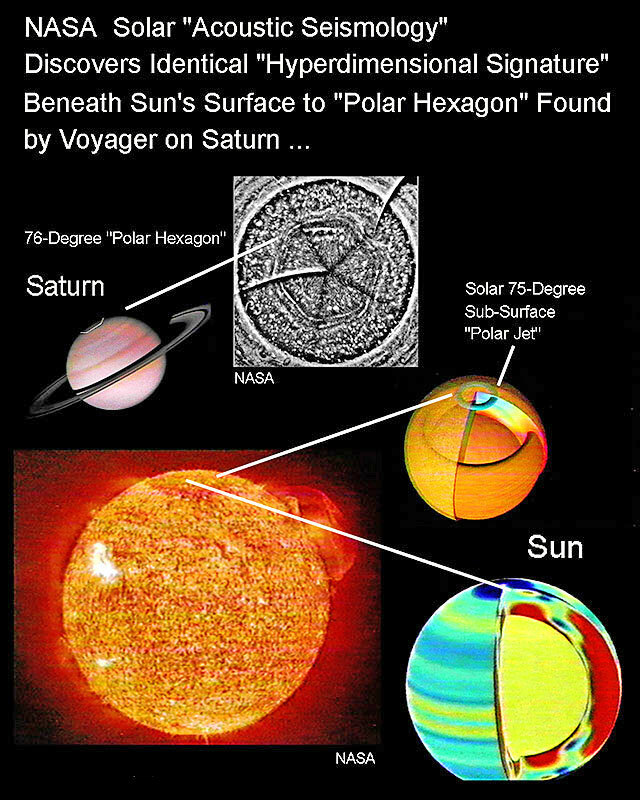 But, if the known changes in solar output are due to hyperdimensional effects of the largest known planets, what of the magnitude of "aether stress" produced by our proposed "new planets" -- with angular momentum contributions hundreds of times greater? ; the long-term cyclic increase in solar energy created by those cyclic phasings (yet-to-be-experienced in recorded history ...) could measure as much as several percent above current solar output. And that’s saying nothing about HD energy added to the internal workings of our planet... from all indications, we are now well into just such a new, long-term, cyclic solar period ... just as the HD Model has predicted. The implications should be obvious. Enter once more, Susan Terebey. 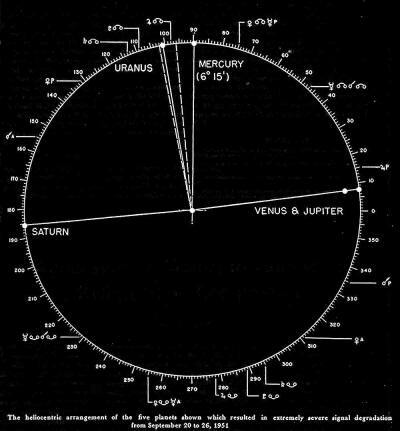 1) Systematic spectroscopic observations (carried out over days or months), to detect the presence of any satellites of this proposed Jovian-type world. 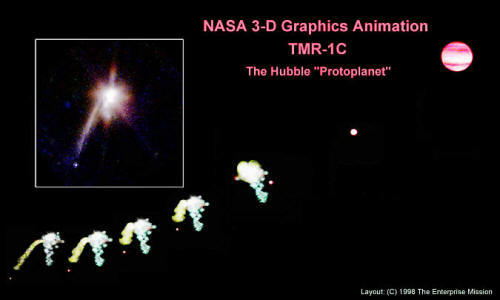 Curiously, this possibility has not even been alluded to in any of the official NASA presentations on this object (see NASA artist’s depiction - click above image). Confirmation of such additional objects would in itself be another major scientific "first." 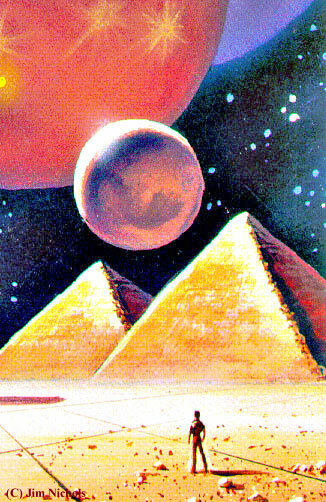 But, in this case, it would also have far deeper implications; some of those same moons could have considerable mass themselves -- perhaps as much as Mars ... or even Earth ... depending on the parent planet’s mass. The latter could, in fact, be independently determined (via appropriate application of "Kepler’s Laws") through physical detection of such moons and determining their orbital periods. 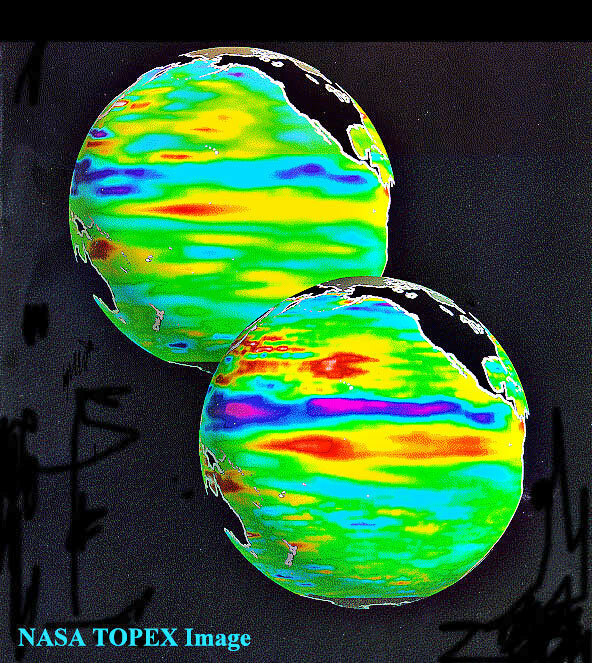 This would then provide a completely independent calibration of the accuracy of the "primary object’s" currently estimated mass -- derived, as Terebey’s freely admits, solely from theoretical "cooling curves" (see above) and the "new planet’s" measured IR luminosity itself. These additional remarkable objects (if they exist ...) should be detectable with a variety of present astronomical technologies -- including Hubble -- provided someone looks. [And, confirmation of truly massive satellites (a "Mars" or "Earth") circling this new "potential planet" could vindicate, in a stroke, a major piece of Van Flandern’s own revolutionary model -- that our own Mars (if not a number of other objects) once orbited a larger planet in this solar system as satellites (click image left)... until all (including Mars) were released by the catastrophic explosion of that "parent world." Understanding the conditions under which these types of "epochal events" could come to pass ... and if, through proper understanding and control of "HD Physics," they can be averted for our planet ... would seem a simple, basic rationale for renewed interest in what Maxwell really stated. Given the demonstrable, historically-unprecedented changes currently occurring in our own environment -- from mysteriously-rising geophysical and volcanic activity (some of the most significant now occurring at that suspicious "19.5 degrees! "), to increasingly anomalous climatological and meteorological activity (does anyone notice that hurricanes have always been born at an average latitude of ...19.5 degrees?) -- verifying the effects of a changing "hyperdimensional physics" in our own neighborhood is far from being "merely academic." Immediate solar predictions of the HD Model are simple and quite clear: increasingly violent average solar surface activity (click image right) -- modulated with the rising and falling with the familiar "sunspot cycle" of ~11 years (cycle #23 should be a "lulu!") -- taking place against a backdrop of equally dramatic, long-term rising of total solar energy emission. For some inexplicable reason, there has been an accelerating slow-down of the Earth’s spin (click below image) on its own axis over the last twenty years -- as measured against electronic transitions of the "Cesium Atomic Clock," maintained at the National Bureau of Standards, in Boulder, Colorado. Theoretically stable to "plus or minus one second in a million years ..." the official atomic clocks have literally had to be adjusted by over 20 seconds in these preceding two decades -- a stunning change by astronomical standards, and striking confirmation of some kind of major, "progressive phase-shift" now occurring, between the rotation of our planet and the atomic-level "constants" that govern the quantum standards of the Clock. This need to, with increasing frequency (now, approximately every six months) update a full second differential between "dynamical time" and "time at the atomic level," is profound confirmation of some kind of fundamental coupling between the angular momentum of our own planet, and the larger changes occurring in the hyperspatial physics of the solar system ... as outlined in the basic HD Model. This includes the possibility that these changing "hyperspatial stresses," due to the progressive orbital movement of our as-yet-undiscovered "outer planets" (in the Model) are simply causing increasing "Maxwellian scalar potential changes" all across the solar system at the atomic level -- changing (via the "Aharonov-Bohm Effect") all resultant quantum-level "constants" governing the clocks by small (but laboratory-measurable) amounts. If this is true, it could thus be the Clocks themselves that are also internally changing ... simultaneous with the predicted, accelerating slow-down in the basic rotation of the Earth! Additional evidence that "something major" is occurring in the solar system, is the recent announcement (by three major "world-class" laboratories) of startling changes in another fundamental physical parameter -- the Gravitational Constant (click below image); according to an article published in "Science News" in 1995, not only has this centuries-old "constant" been found to differ now from all previous "textbook" values ... each of the three laboratories reported different changes ... the largest amounting to a whopping (by measurement standards) 0.06%! Completely inexplicable by any mainstream theories, such changes are intrinsically expected (ala Whittaker’s derivation of "electrogravitic" linkages between gravity and light) in the true Maxwellian analysis of "varying scalar potentials" of the vacuum. Again: changes modulated by the changing phase relationships between our proposed "undiscovered outer planets" in the "total solar system angular momentum equation." There is insufficient room to develop here (let alone to document) all the additional implications stemming from this Model (that will be done elsewhere). Suffice it to say, this is intrinsically a changing physics, affecting every known system of astronomical, physical, chemical and biological interaction differently over time -- because it affects the underlying, dynamical hyperspace foundation of "physical reality" itself ... starting with this solar system; that is implicit in the Model. And now, according to all accumulating evidence and this centuries-old physics ... we are simply entering once again (after "only" 13,000 years ...) a phase of this recurring, grand solar system cycle "of renewed hyperdimensional restructuring of that reality ..."
It is for these basic reasons that NASA must now openly -- and rapidly -- carry out these recommended new observations of the solar system, including additional, detailed measurements of "TMR-1C" ... and then immediately tell us the results.